Of famous men, whose names he once enroll’d. And so we learn of a traveling bookseller in eighteenth century England. 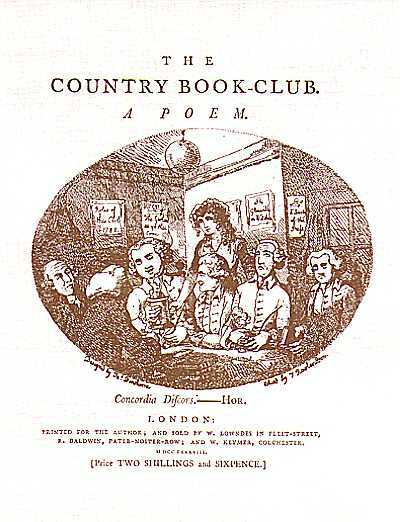 The stanza is from A Country Book-Club, a poem written by Charles Shillito and published in 1788. Shillito published it himself by subscription. Rev. Bland, Miss Bull, Major Blatch, Mr. Best, Mrs. Butts, Mr. Eye, Mrs. Gepp, Mr. Goff, Mr. Love, Mr. Mow, Mr. Plite, Miss Sturgeon, and Mr. Swallow are amongst the many that Shillito put the bite on to raise funds for its publication. After a preamble that ambles in slo-mo through a lyric paean to the joys of learning and erudition, the poet introduces us to his pastoral book-club, followed by a conclusion tacit in the original but implied by modern trends. And taste the sweets of lit'rature - and wine. The motley members of the Book-club meet." Blotto recitations are their emblem. As a drinking club with a reading problem. "Read up, people, today ev'rybody gets a FREE CAR!!!" It's easy to mock group-read, we misfit readers, yet they played a crucial role in the late eighteenth century well into the nineteenth as primary diffusers of knowledge in a world without public libraries, fostered the love of reading and of books, and went a long way toward popularizing the novel, not just in the cities but in the countryside as well, particularly so. Little is known of Charles Shillito. OCLC notes three other works by him: God Save the Queen! (1761); The Sea-Fight (1779); and The Man of Enterprise (1789). SHILLITO, Charles. The Coun­try Book-Club. A Poem. Lon­don: Printed for the Author and sold by W. Lowndes …, 1788. Quarto (28 cm). 39 pp. Illus­tra­tion on titlepage etched by Thomas Row­land­son. Image courtesy of James Burmester Rare Books, currently offering this item, with our thanks. A tip o' the hat to Judith D. Henry for the the first apocryphal stanza's last line.